Mex should require no introduction, but then by the same token the Annoying Orange shouldn't be president, so if he does then I refer you to the reviews I wrote as reproduced here and here so as to avoid having to repeat myself. Intense Living was the second album and it's a huge pleasure to have it remastered and on a fancy compact disc and everything. As with Alternative Pop Music, it's still a little rough around the edges and I suppose might be termed lo-fi if you want to make a virtue out of the fact - which always struck me as a bit pointless, personally speaking; but the material and the sheer joy and punky spirit of the whole enterprise - or possibly post-punky spirit - should compensate for how difficult it is to hear Cliff Silver's wristwatch ticking away during the quiet parts. 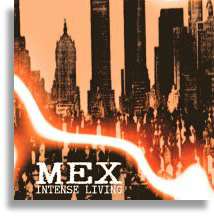 Where the first tape was mostly just Mex, so far as I recall, this one was Mex aided by the aforementioned Cliff Silver from Sad Lovers & Giants, and with a live drummer - or possibly a tape of a live drummer - and it's very different. In fact, it was very different to every other tape I bought that year. I seem to recall my corner of 1981 involving a lot of long coats, many of them worn by myself, some sucking-in of the cheeks, and a fairly austere embrace of the return to year zero proposed by punk, or by some elements of punk. In the meantime, Mex had added shameless disco to the ingredients of his pop perfectionism, and not even the studiously cool kind of disco favoured by chiselled Mancunians with trumpets. I'm talking walking basslines, wah-pedal funk, flares, glitter balls, and a synth borrowed straight from the Open University Department of Television Signature Tunes. Add to this Mex's occasional Duane Eddyisms and somewhat whispy - at least on this occasion - vocals, and the result was a tape which just didn't sound like anything else in my collection, and didn't even seem like it was trying to sound like anything else. Some of it has dated, I suppose - the short-wave radio twiddling of Alien Transmission - but not in a bad way, and the whole nevertheless sounds as great now as it did back then. If you require references, it might be argued that the first Denim album had something of Intense Living about it, and there are bits which remind me of LCD Soundsystem; but I'm reaching, because neither of those were ever embedded in my consciousness quite like Sea of Green, Full of Eastern Promise, or Keith in America.